I’m not going to cover what containers are or what Docker is. For those that don’t know, think of them like small packaged, deployable virtual machines. A little better but still not really clear what it does. Kubernetes manages containers over multiple nodes (ships). It’ll manage where containers need to go to make the best use of the resources available. If a ship sinks, it’ll replace the lost containers on the remaining ships. The smallest unit Kubernetes cares about is called a pod. A pod can contain one or more containers but Kubernetes only ever cares about the pod. A pod is a single running instance of an application. A replica set is used to create multiple instances of pods. It defines what the pod should look like and how many there should be available. A service gives a way of discovering applications and handles connecting a request to an available pod. An ingress provides an external endpoint to connect to a service in the cluster from the outside world. Some other available resource types that I won’t be covering. 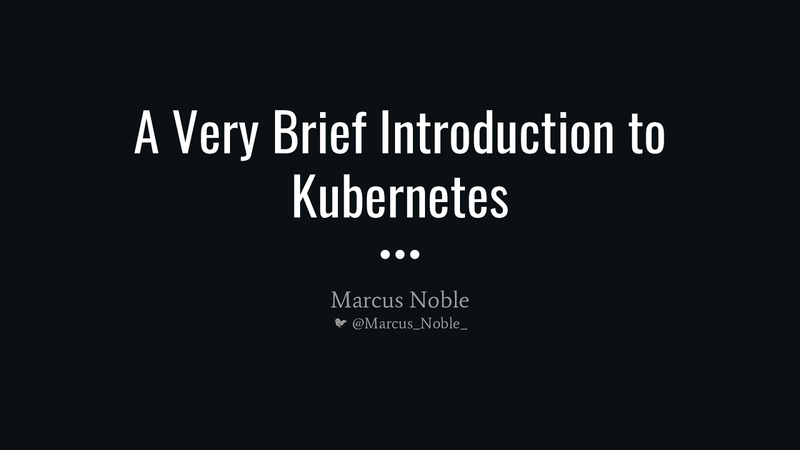 View A Very Brief Introduction to Kubernetes on Notist. Marcus puts presentations on for free. You can too.